John Cowell, 27, was arrested for fatally stabbing 18-year-old Nia Wilson. Cowell had recently been released from prison after a two-year stint for a robbery conviction. Photo courtesy of Bay Area Rapid Transit police. Bay Area Rapid Transit police in San Francisco on Monday night arrested a man suspected of fatally stabbing a woman in a train station the night before. 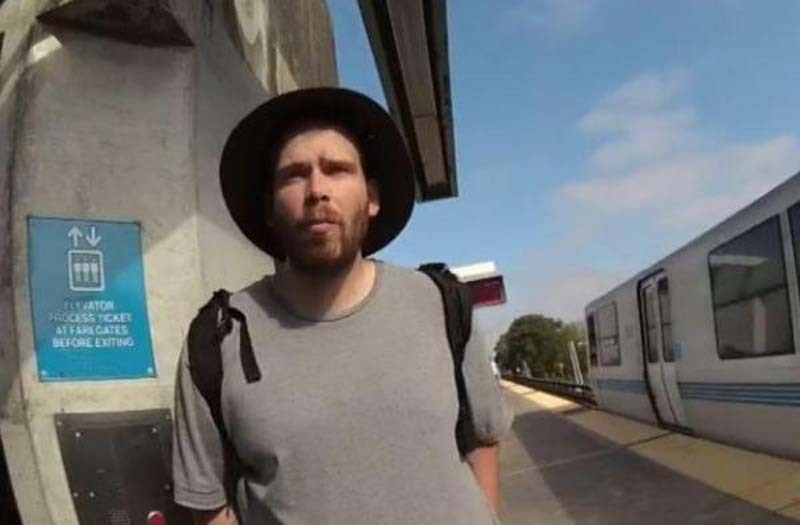 John Cowell, 27, was arrested for he murder of 18-year-old Nia Wilson, who was killed as she and two sisters were transferring trains at the MacArthur Station in Oakland. Police said Cowell stabbed her and also stabbed Wilson's sister, 26-year-old Latifah Wilson, who survived the incident. [post_ads]"As they were transferring at the MacArthusr platform, they were approached by an individual with a knife who truck very rapidly," Bay Area Rapid Transit Police Chief Carlos Rojas said at a press conference Monday night. "In my close to 30 years of experience, it was probably one of the most vicious attacks that I've seen," Rojas added. After the stabbing, Rojas said Cowell fled to the parking lot and changed his clothes. The knife suspected of being used in the stabbing was found in an adjacent parking lot. Rojas said surveillance cameras recorded Cowell stabbing the Wilson sisters on the train station platform and changing his clothes in the parking lot. Police spread transmitted images of Cowell taken from surveillance cameras on social media as they searched for him or nearly 24 hours. Based on an anonymous tip, Cowell was located Monday night at the Pleasant Hill station in the BART system and arrested "without incident," police said. Cowell is white and the Wilson sisters are black. The races of the suspect and victims sparked suspicions that the act was a hate crime and that police weren't doing enough to find the suspect. "Nia Wilson was murdered last night at MacArthur @SFBART station in Oakland, CA by a white male still at large," one person said in a tweet that was retweeted more than 4,000 times. "Where is the security footage? Where are his photos & why aren't they being plastered everywhere? What is BART going to do?" Nia Wilson's godfather, Daryle Hallums spoke at the press conference Monday night and urged the black community to wait for the outcome of the investigation. "We don't know if this was racist, we don't know if this was random, we don't know what it was," Hallus said. "But we're asking the African American community to stand down right now. Let's get this information to find out what really happened." The East Bay Times reported on several incidents in which Cowell demonstrated violence by threatening to hurt or kill people. He was recently released from prison after a two-year robbery conviction and was on parole at the time of the attacks against the Wilson sisters.